Students who have demonstrated the interest and aptitude for undergraduate research are encouraged to participate in a summer research program or a research project with a member of the Mathematics Department. The Math Department regularly notifies students of special research opportunities such as the National Science Foundation sponsored Research Experiences for Undergraduates (REU), and assists students in the placement process. 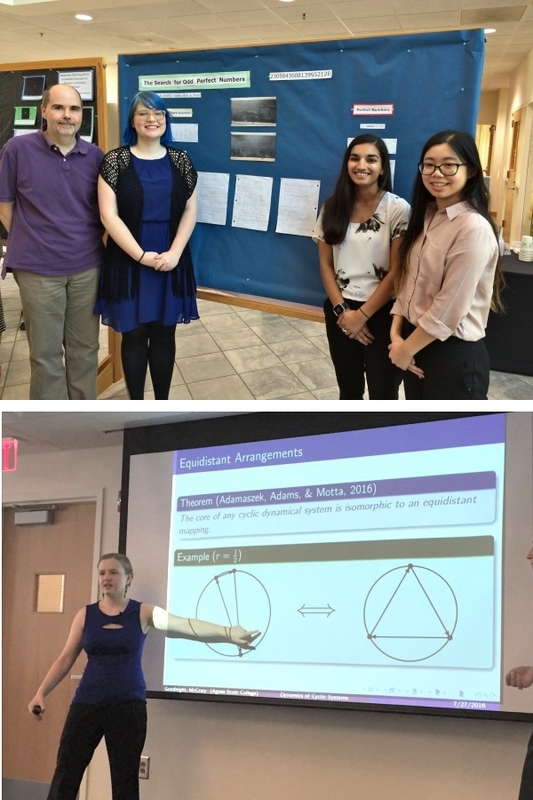 In the past several years, Agnes Scott students have participated in REU programs at Miami University, Clemson University, Carleton College, and George Mason University. This program provides opportunity and funding for ASC students and faculty to conduct summer research projects together, and will include supportive programming for both students and faculty. Contact Molly Embree, the STEM Fellow for Mentored Research, in the Bullock Science Center for more information and application materials. Opportunity for summer research at various colleges and universities around the country. These are usually announced in December or January. Watch the Math Department's Facebook page for notices about the summer REU's. The following links also contain information about many REU programs. The EDGE Program, funded by The Andrew W. Mellon Foundation and the National Science Foundation, is designed for graduating seniors who have applied to graduate programs in the mathematical sciences. Its goal is to strengthen the ability of women and minority students to successfully complete graduate programs in mathematics. Tiffany Troutman, class of 2003, was an EDGE 2003 participant.